Have you always wanted to run 10km or even a marathon? Or is a triathlon more appealing to you? At Equilibrium we can cater to the beginner athlete up to the elite level athlete. 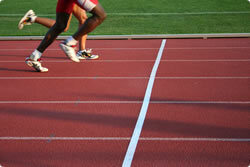 You may just be starting out in sport and have a specific goal to work towards, such as a 5 km run. You will be taken through a performance programme that is specific to your needs, requirements and your level of athletic ability. However, for those wanting to take their level of performance that one step further in their chosen sport, you may require a more detailed process. You will then be analysed in the specific requirements to your sport to see if there are any weaknesses that need to be rectified to improve your overall performance. From this analysis your Performance Enhancement Training Programme will be determined and implemented. This will obviously vary from a season long programme, to a pre-season programme, to training towards a one off event. To best determine your individual requirements, please complete the following form.